Doodlecraft: Tombow Dual Brush Pens 12 New Colors in November VIP Box! 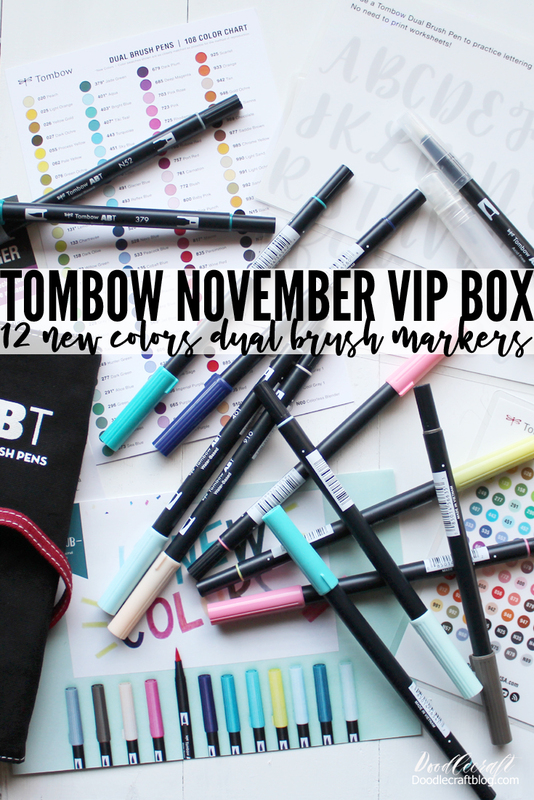 Tombow Dual Brush Pens 12 New Colors in November VIP Box! As an American Tombow Inc. Brand Ambassadors, I receive product to review each month. This is a particularly exciting month and I've included affiliate links in the post. All opinions are mine. Exciting news today with the newest VIP box from Tombow--12 NEW colors of Dual Brush Markers! This box is packed full of great items, perfect for getting started--and makes an amazing gift! They will sell out fast, so get yours now. Since I've been doing Fantastic Beasts all week, Newt Scamander would let you know you "My philosophy is that worrying means you suffer twice". This was written in the new Jet Blue. I love it! Starting with 12 new colors of Dual Brush Markers. These are the colors you wish had existed! 6 gorgeous shades of blue, 3 shades of pink, 2 grays, and lemon lime! You will also receive this Dual Brush Marker travel roll-up case. Perfect for taking supplies on the road, to school or to a lettering event! You will also get the Blending Package! It comes with a blending palette, blending brush pen and tiny misting spray bottle. Perfect for creating backgrounds, blending letters, watercoloring, and ombre lettering! Also included is a reusable lettering guide! Simply practice the letters on the laminated page and wipe off and repeat. Save on paper and get lots of practice in. Another fun thing is this color chart. Now that Tombow has 108 colors, you'll want to keep track of the colors you have! One side has the list of all the colors, their number, name and shade. The backside is ready for you to fill out with your marker collection. This way you can see the colors you have and know which ones you need to buy. Dual brush pens are smooth and thick, great for hand-lettering. But don't forget to pick up a package of the Fudenosuke Colors! Head to Tombow and buy your VIP Box now!